Total amount must be paid by credit card 3 weeks before arrival for groups of 10+. For groups of 20+ persons or more, payment must be paid 6 weeks before arrival date. Once payment is taken the booking cannot be altered or cancelled, so Nelly's recommends that you collect all of your group's payment before that date. Male groups of 5 or more from UK or Ireland must fully book all dorms they occupy and cannot share with other guests. If a group wishes to change numbers before payment date this depends on availability. All groups of males from UK or Ireland cannot share dorms with other guests so they must book all beds in dorms they occupy. They must pay a 30 euro security deposit per person on arrival, sign a group booking conditions declaration and agree to follow house rules [see booking site]. Deposits are returned at departure after rooms have been inspected. All guests must have individual room keys [10euro CASH deposit]. All groups must check in before 11pm unless previously agreed with Nelly's and must be sober on arrival or they will be refused check in until they sober up. Named after the famous Irish legend, known for hospitality, warmth and generosity, Durty Nelly’s Hostel and Irish Bar offers clean and comfortable accommodation, with awesome staff, in a great location! Located in the historical centre of Amsterdam, in a traditional Dutch building, we are only a 7 minute walk from Central Station, 2 minutes from Dam Square and only 1 minute from the infamous Red Light District! If you are up for sightseeing during day and partying in the evening – you’ve found the perfect place! Our reception is 24/7 and our multilingual staff are ready to help you organize your stay– from free city walking tours, discounted tickets for tours and attractions, canal cruises, pub crawls & bike rentals! Get yourself set up for a day of exploring with our big breakfast buffet (available every morning), or get yourself a fry up and cure that hangover in our Irish bar. 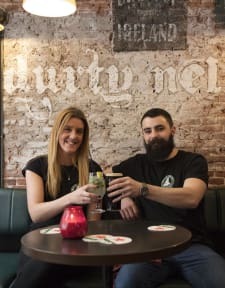 Our famous Durty Nelly’s Irish Pub is known for years as a travelers meeting point, with a great selection of beers, spirits and delicious food – all of which hostel guests get a20% discount on! Party in our bar with live sports on TV, our pool table, and our DJ on the weekends – or relax and chill out with our free, fast WiFi throughout the whole building! Special conditions apply for group bookings and stag parties. We accept guests from 18 years to 65 only. Located right in the middle of the city with everything a short walking distance. All the staff were incredibly nice and welcoming. The atmosphere of the bar was really good with, TVs to watch sport and live entertainment. The room was ok but found a lot of dust in easily reachable places. If you don’t mind staying in a hostel (we booked 2 whole rooms) then it’s definitely value for money. The facilities were all very good, only problem was my shower was rather weak but was fine for wash.
Great no frills place to lie your head at night. Plenty of space to store your belongings, great staff, and relatively quiet given the location in the heart of city center. Dorm area could have been a bit cleaner, and showers definitely could have. Showers also have little to no pressure/water flow. Overall would definitely stay again. Was only here for a day trip to Amsterdam. Not the best but not the worst hostel. Not as social or clean as I was expecting, but for the price and location I think it was way worth it! It was a good hostel! I appreciated the food and drink discounts at the bar, but it was sometimes hard to sleep because people outside were always so loud. But the location otherwise was pretty centrally located in Amsterdam, which was great! Location is Best. Room was not that clean and not even washroom. Lively atmosphere near hostel and staff is also good. The location is what made me pick this hostel. I booked a mixed room and some strange older men stayed with us, but I suppose that's the luck of the draw. Bathrooms were less than ideal but if your only reason for picking this is because it is close to bars and coffee shops, then its great. Plus they give you a discount for the bar downstairs. The hostel is just a 10min walk to the central train station and in the middle of the redlight district. It's super save even at night. The hostel itself was quite dirty and the lockers have been ridiculous. One night i left some bread in my locker and a mouse (or anything else) has eaten it and left a hole in my bag. I told the reception and they weren't really surprised about it. Toilet and shower is in the same room. Stressy in a 10 dormitory. I stayed in a 10 person room. It was more like 10 people and a rat. We were woken up both nights to some rodent going through people’s things. I saw in the reviews that this has happened in the past and they claimed it was taken care of. Do not stay here. There is a reason it is cheaper than most places in Amsterdam.